Today at school we had a tech coach retreat. As we are preparing for a robotics PlayDate next month, we spent some time exploring the possibilities of some of the new robots that we have purchased this year. We have BeeBots for our youngest students in Pre-Kindergarten and Kindergarten, Dot and Dash for Grades 1 and 2, Roamers for Grade 3 (though they are still held up in Indian customs) and Spheros for Grades 4 and 5. The idea of today's retreat was to play with each of these, try things out, learn by doing and failing, and think about the best ways to integrate robotics into our programme. It is well to cultivate a friendly feeling towards error, to treat it as a companion inseparable from our lives, as something having a purpose which it truly has. Alongside this quote and the graphic, I want to mention a couple of things from the next chapter of The Innovator's Mindset by George Couros. George goes beyond the idea of failure and mistakes to something that I think is even more important - the idea of trying again after failure. I was thinking about this as were were doing some block coding and driving of our robots today. We weren't following any instructions but simply playing - sometimes the robots didn't do what we wanted them to do and we had to troubleshoot - in some cases making small adjustments to our programme and then trying again. What George points out is that while failure can be important to innovation, what's even more important is resiliency and grit - learning from mistakes and trying again to do better. 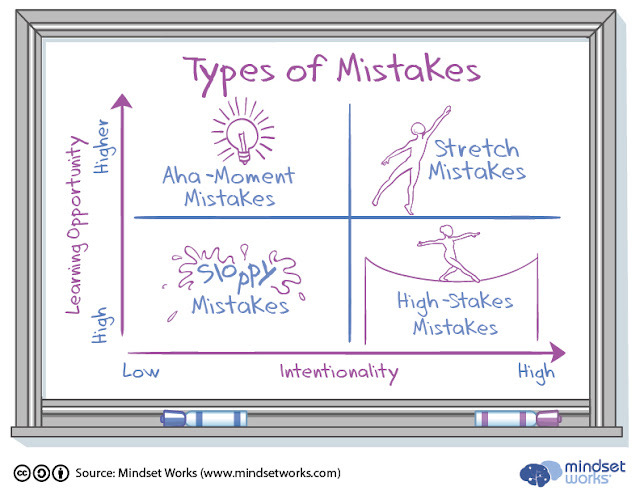 Let's think about the 4 categories of mistakes mentioned in the graphic. The best learning opportunities are going to come from what is called "stretch mistakes" which is where we are expanding our capabilities. Whenever we try to do something that is beyond what we can already do, then we are bound to come up against some roadblocks and make some errors. Maybe this is what Vygotsky called "the zone of proximal development" where things are really still a bit challenging for us but where with support we are learning some new skills. At this point it's important to reflect on our learning - and then commit to application so that we change our approach and master whatever it is that we are finding challenging. With this resiliency and grit, stretch mistakes can be extremely positive. The second category of positive mistakes is that of the "aha moments". This mistake is interesting because we actually do achieve what we have set out to do - but along the way we discover that what we tried to do was based on incorrect assumptions. Once again, the way to move forward is to be reflective, and to think about how we can change things to get a better result the next time. There are some mistakes that we don't learn much from, for example we make "sloppy mistakes" when we are not concentrating. High-stakes mistakes are definitely ones we don't want to make and then learn from, because high-stakes mistakes are the ones that are risky and potentially quite dangerous. They could also be bad mistakes to make if other people are relying on us. 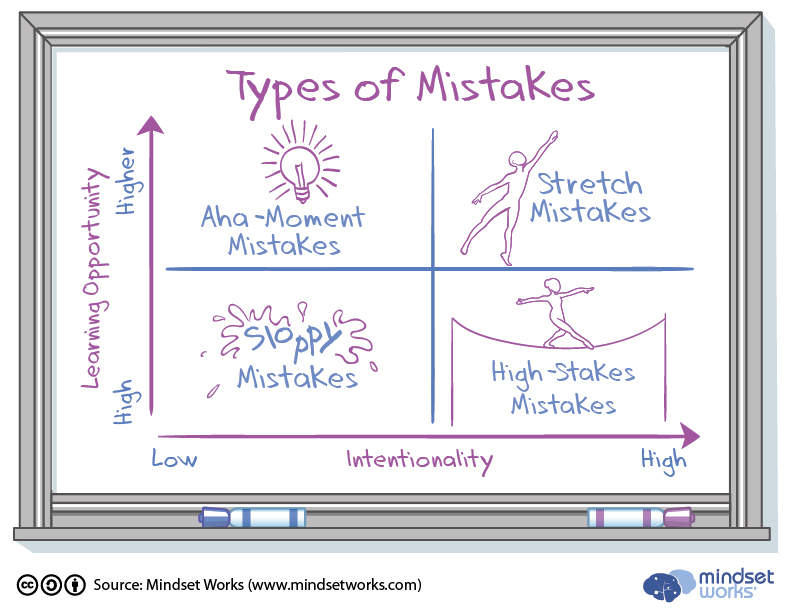 The basic argument of the article is that "mistakes are not all created equal" and adding onto this is the message from George Couros that if we don't have resilience and grit to come back after a defeat or an unsuccessful attempt, then mistakes are not experiences that we can learn from.